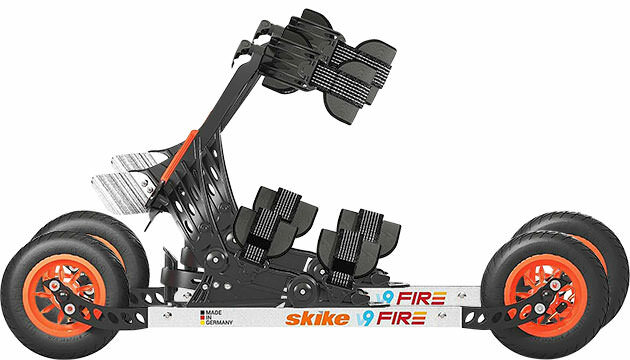 The Skike v9 FIRE 150 is the "little brother" of the Skike v9 FIRE 200. It does have 150mm (6 inches) air tyres. The brakes are equipped with cooling gills, that help to cool the aluminium during the braking. This reduces the abrasion of the tires. The skates can be worn over regular shoes. There is the option to adjust the skates to in- or out-knees for individual fitting. The Skike v9 FIRE 150 also offers the option to choose one of two heel lift options, for either classic style or skating style. The two reverse locks also enable you to skate uphill.